This review first appeared in Turbula in May 2010. Novels with murderers as the protagonist are becoming their own little genre, what with Patricia Highsmith's Tom Ripley novels and Tim Dorsey's Serge Storms series. 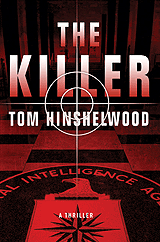 The debut from English author Tom Hinshelwood is closer to Highsmith than Dorsey, with his Victor an out and out assassin. Where Dorsey takes the edge off Serge's serial murders through over the top humor, Hinshelwood's "The Killer" is a straight-ahead thriller. It doesn't have the noir characteristics of Highsmith's works, though: Still, unlike in Robert Ludlum's Jason Bourne novels, Victor knows he's an assassin, and seems to be at peace with it morally. In that, he's akin to Ripley, who's psychopathic killings are totally divorced from his interior life. But if "The Killer" is a standard spy thriller, it's a thriller of the highest order  opening at breakneck speed and never really letting up. A few plot points seem a touch outlandish, but for the most part "The Killer" adheres to standard thriller conventions. There's a love interest, of course, and betrayal and confusion. Mostly, though, there's a story line rich in characters and intrigue, and Hinshelwood keeps his foot hard on the gas pedal the whole way. As with Ludlum's Bourne novels, Victor's efforts to escape forces he can't even identify take him across most of Europe with a body count that you quickly lose count of. As Hinshelwood peels back layer after layer of his intricate plot, both the reader and Victor slowly realize just how big the web is that's ensnaring this free-lance assassin. The novel is clearly set up for a sequel (or two, given that spy novels seem to come in threes), as well as big-screen treatment someday. If Hinshelwood can keep writing at this level, future entries in the series could well turn Victor into the kind of memorable prototype that Tom Ripley and Jason Bourne have become.